When he wants to get mathematics done, IAS emeritus professor Pierre Deligne takes to his bed. A big cushion at his back, legs outstretched, reclining atop the covers, he is tucked in by a quilt of papers spread all around. His office, meanwhile, serves as a staging ground of sorts. Conveniently located just off the mathematics library (all the better for research), it is furnished with a podium and a harvest table of a desk, also slathered in papers and more papers. “I have now too much disorder,” says Deligne. “I need to throw out half of this and file the other half.” But at the moment he can’t spare the time. He is preparing a talk for an upcoming Bourbaki Seminar in Paris. Pierre Deligne on a Belgium postage stamp. 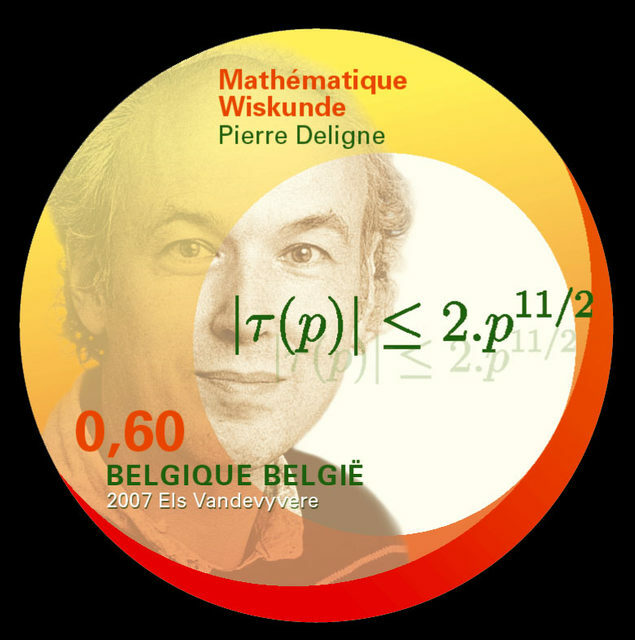 Deligne, a boyish-looking 67-year-old, got his formative start in mathematics when a high school teacher lent him several volumes of Elements of Mathematics by Nicolas Bourbaki, the pseudonymous éminence grise of French mathematics. From there he never looked back. 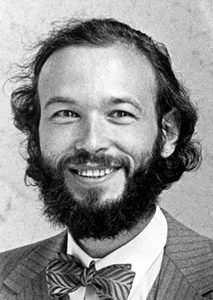 He is best known for work he did nearly 40 years ago on the famous conjectures posed by André Weil, the de facto leader of Bourbaki, a secret society of French mathematicians that propagated a comprehensive overhaul and rigorous treatment of modern mathematics based on set theory. Deligne completed his Ph.D. at the Institut des Hautes Études Scientifiques under the legendary Alexander Grothendieck, a Bourbakist who transformed the subject of algebraic geometry. 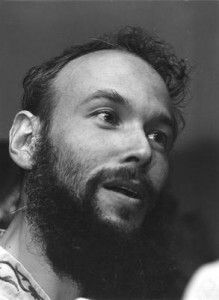 Grothendieck’s results paved the way for the proof of the Weil conjectures, with Deligne completing the proof for the last and most difficult of the conjectures in 1973. Deligne’s inimitable taste makes him outstanding in many of life’s dimensions. He doesn’t own a car and bicycles everywhere, keeping his right pant leg perennially tucked into his sock. He has quite possibly never been seen in a suit, favoring instead well-worn sweaters in earth tones. In Princeton’s flash rainstorms he has been known to strip down to the waist to minimize the damage, though he does not take this strategy to the logical extreme. He cultivates his mathematical labors with a similar perseverance and patience—picking what is ripe from his harvest table of possibilities. 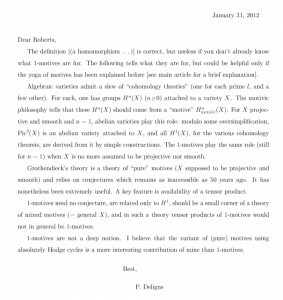 While the notion of “motive” originated with Grothendieck, the concept of “1-motives” is one of Deligne’s contributions to the theory. “What is a 1-motive?” Tate asks himself, reiterating what turns out to be a question difficult to answer using non-mathematical language. 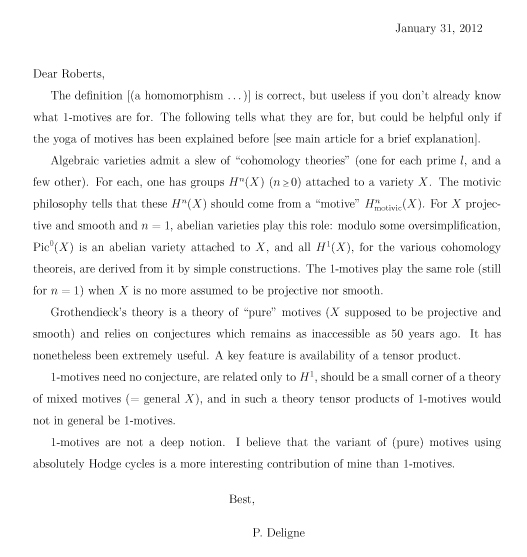 The quality that makes Deligne stand apart as a mathematician is also difficult to describe. He is sharp. He goes directly to the point. He has one of the very best minds. At somewhat of a loss to be more specific, Serre instead offers illumination by counter-example. “Maybe I tell you some little defects he has when he gives lectures,” he says. “When he gives lectures, he writes extremely small and he speaks so low that it is really hard to understand. And he does not stress anything. He’s not making propaganda for what he’s doing. He’s just telling it.” Serre recalls an international meeting in the 1970s when Deligne was delivering a series of lectures. The audience, desperate to follow along, wrote beneath one of the shifting blackboards during the intermission: “Write Larger and Speak Louder!” After revealing these instructions, Deligne, ever THE anti-showman, obeyed for about two minutes and then returned to his understated status quo. Deligne’s search for understanding is driven by his insatiable curiosity, almost to a fault (to point out another so-called defect). For example, he voluntarily retired several years early so as to reduce his faculty responsibilities, since in reading applications of prospective members for the School of Mathematics he was forever tempted to try out the applicants’ proposed lines of investigation and thus forever distracted from his own research. He is also known for understanding things very thoroughly. So much so that when his children had trouble with their homework and sought his help, they had to plead with him—”Please, Daddy, just give us one way!”—lest he explore every possible way of making sense of things. Similarly, he gained a reputation for the extensive notes he complied for his own erudition on various subjects, which colleagues always wanted to obtain, and which he was always happy to share. 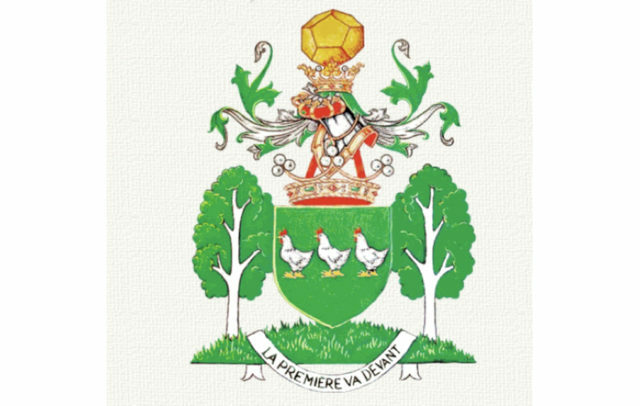 Ennobled as a Viscount in 2006, Deligne designed his own coat of arms. The prominently placed trio of hens was inspired by a nursery rhyme, which by Deligne’s grownup interpretation proceeds as a succession of tautologies. Mathematical discourse, he argues, proceeds in a similar fashion. La troisième est la dernière. The third one is last.